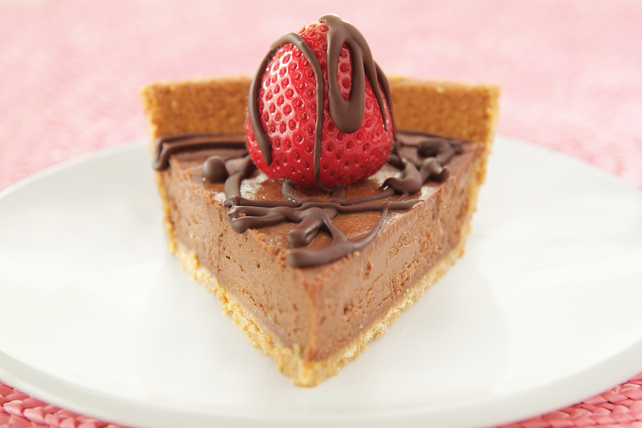 Baked in a graham crumb crust, this delicious chocolate cream cheese pie is topped with fresh whole strawberries then drizzled with melted chocolate. Melt 3 oz. chocolate as directed on package. Beat cream cheese, sugar and vanilla in large bowl with mixer until blended. Gradually add melted chocolate, mixing well after each addition. Add egg; beat just until blended. Pour into crust. Bake 35 min. or until knife inserted in centre comes out clean. Cool completely. Refrigerate 3 hours or until chilled. Break remaining chocolate into small pieces; place in medium microwaveable bowl. Add butter. Microwave on HIGH 1 min. or until butter is melted. Stir until chocolate is completely melted and sauce is well blended. Arrange strawberries on top of pie; drizzle with chocolate sauce. Refrigerate until chocolate is firm. Prepare recipe as directed, substituting 1 cup Baker's Semi-Sweet Chocolate Chips for the chopped chocolate.